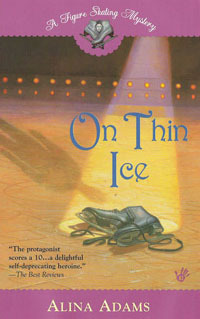 Adams, who has worked as a figure skating researcher for several TV networks, really shows the back stage realities of the figure skating world, which she views with a sardonic and somewhat cynical eye. The ending came as a complete surprise, but was accurately foreshadowed in the text. Adams misplaces the 1977 World Championships (they were in Japan, not Russia ) and the cover shows an ice rink, supposedly in Moscow, that has Leningrad written in Russian characters on the sideboards. Re: the latter, I can only assume Ms. Embler means the text on the barrier behind the skater. But, in that case, it doesn't say "Leningrad" in Russian, it actually says "Championat" or "Championship." About the former, however... I deliberately set all of my skating novels in a fictional universe, to prevent jarring things like a man claiming to be the 1988 Olympic Champion when, as well know, it was really Brian Boitano. 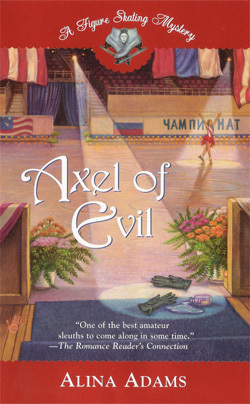 That's why the victim in "Axel of Evil" was the 1978 Olympic Champion, a title no one else can lay claim to. That being the case, I had no qualms about moving the 1977 World Championships from Japan to Russia, or setting the 2003 one in San Francisco. 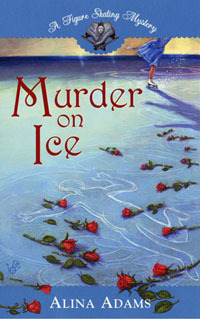 My stories exist in an alternate skating universe. To be fair, my wonderful editor (and big-time skating fan) did try to get me to anchor my tale with real Olympic years, but I thought my way was better. (Doesn't every writer always think their way is better?). So now I put the question to you: Should I have stuck to the facts, or fictionalized them? i just wonder why does the text on a barrier reads "Championat" rather then "Chempionat', which is a correct spelling?